When you have a motorcycle accident in Azusa, you need to have the legal backing of a reputable law firm to fight for your right. An experienced motorcycle motor accident attorney in Azusa who’s proficient in such legal matters would do your case a wealth of good. At Rawa Law Group, we have a team of experienced lawyers (with a combined experience of over 55 years) who are willing to take up your case and help you win maximum compensation payable by law. Our law firm is a superior 5-star law firm and employs the services of top personal injury lawyers in California. With flexible hours of appointment and lawyers who are able to meet you outside the confines of our office if you are not able to leave your home or the hospital, Rawa Law Group lawyers are always ready to serve. 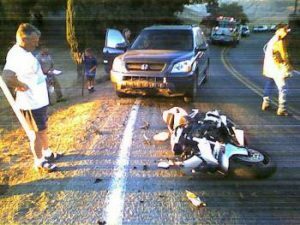 At Rawa Law Group, our motorcycle accident attorneys in Azusa know these cases like the back of their palms and have helped many of our Azusa claimants win settlements totaling hundreds of millions. If you are looking for an ethical legal counsel with no hidden charges and would like to have a personalized service, Rawa Law Group is the ideal firm for you. Our lawyers have a deep sense of commitment to work and are relentless and tireless in their fight for the injured. While handling your case, our professional attorney in charge keeps you updated on proceedings from start to finish. At Rawa Law Group, cases we handle require no deposits and we only get paid once we have successfully helped you win a decent settlement.